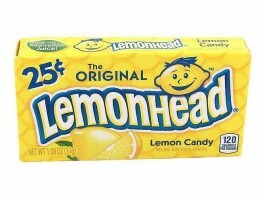 De Authentieke en Originele Lemonhead Lemon Candy sinds 1908. Citroen snoepjes met een harde binnenkant en een omhulsel van citroenglazuur. sugar, corn syrup, modified food starch (corn) citric acid, lemon juice from concentrate, confectioner's glaze (shellac), Natural and Artificial flavors, Acacia (gum arabic), Modified Food Starch (corn), Carnauba Wax, Yellow 5, White Minaral Oil. This product was manufacturered in a facility where milk, eggs, almonds, coconut, peanuts and soy are used in the production of other products.